The MAX M. FISHER AWARD FOR OUTSTANDING PHILANTHROPIST is presented to an individual or family with a proven record of exceptional philanthropic generosity, whose demonstrated philanthropic commitment encourages others to take leadership roles in philanthropy. The EDMUND T. AHEE JEWEL AWARD FOR OUTSTANDING VOLUNTEER FUNDRAISER, in memory of Edmund T. Ahee, is presented to an individual who has demonstrated exceptional leadership skills in volunteer fundraising, and in coordinating and motivating groups of volunteers for major fundraising projects for more than one non-profit organization. The OUTSTANDING CORPORATION AWARD is presented to a corporation or its corporate foundation for demonstrating outstanding commitment through financial support and through encouragement and motivation of others to take leadership roles in philanthropy and community involvement. The OUTSTANDING FOUNDATION AWARD is presented to private foundations that demonstrate outstanding commitment through financial support and through encouragement and motivation of others to take leadership roles in philanthropy and community involvement. The DR. JOHN S. LORE AWARD FOR OUTSTANDING FUNDRAISING EXECUTIVE is for an outstanding individual fundraising executive who practices his/her profession in an exemplary manner. 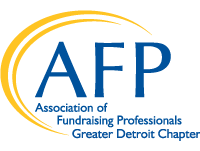 The recipient must have at least ten years of professional fundraising experience, evidence of quality of leadership and acting as a team player, be a current member of AFP, commitment to continuing professional development, and commitment to fundraising and philanthropy through volunteer service and financial support of non-profit organizations. The SPARKY ANDERSON AWARD FOR YOUTH IN PHILANTHROPY was instituted as a way to recognize and reward philanthropic young people and to educate youths about the importance of helping and giving. When children are personally involved and actively engaged in a project, their “hands-on” experience greatly enhances the learning experience. The purpose of the youth award is three-fold: first, to thank students for volunteering their time and energy to a particular project; second, as an inspiration to encourage other children to become involved in fundraising activities by following the example of the winners; and third, to give public recognition to youths and their philanthropic projects. The NEAL SHINE AWARD FOR MEDIA COMMITMENT TO PHILANTHROPY is presented to individuals with at least 20 years of media activity focusing on building communities, demonstrating a consistent ethical foundation, showing a commitment to and success in making metropolitan Detroit a better place to live, and developing leadership and personal involvement in others. The GEORGE W. ROMNEY AWARD FOR LIFETIME ACHIEVEMENT IN VOLUNTEERISM is given annually to one or more persons who have contributed many years of service to the community and who have simultaneously exhibited quality fundraising and personal giving, offering inspiration to others, and contributing their time and energies to charities of their choice.